Eurotramp proudly presents a complete Trampoline Education Program to make trampolining more attractive as well as to improve safety in school sports. 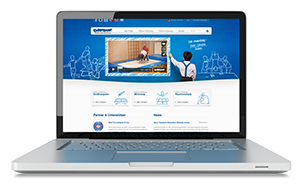 The Trampoline Education Program contains training videos about Trampoline, Minitrampolin/Parcours and Psychomotricity. It is an excellent supplementation for any practical training for beginners. Once you have registered for free you can watch the videos on www.trampoline-education.com or of course you can order the complete program as DVD (4 hour program) in our webshop www.eurotramp-merchandise.com. At the moment the Education Program is available in German, English and Portuguese but we are working on other languages. For any versions in foreign languages we look for your help! If you are interested, please write an e-mail to: eurotramp@eurotramp.com!